Downton Abbey heroines aren’t the only ones who can wear lace! Shades of Irish crochet appear in the motif and also in the picot pattern used at the sides and shoulders in this design. Layer it over a tee for casual wear, or over a black tank for a dressier look. This is a gorgeous cardigan worked in floral motifs that are joined as you go, which means no after-pattern sewing! Featuring a wide, square neckline and three-quarter length sleeves, this classic top boasts the perfect spring fit. 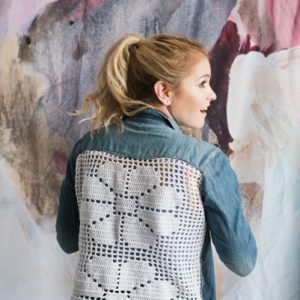 Upcycle a plain button-up shirt into a stylish, eye-catching piece by replacing the back with a new filet crochet panel. 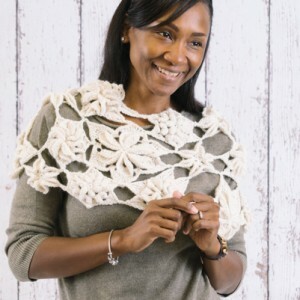 Once you get over the initial unease of combining crochet with existing pieces, you won’t believe the stunning combinations you can create! Add a little roar to your next ensemble with this crochet take on leopard print! Whether you dress it up or down, this incredible scarf is a must-have for the fall and winter season. 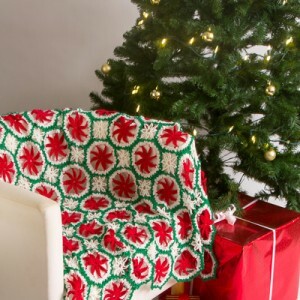 Vivid red poinsettia motifs are framed in white and green while a pretty little join resembling a snowflake fills in the holes between motifs in this festive holiday throw. This intricate pattern makes a fun holiday decoration for any couch or chair this Christmas season. Take a stab at freeform crochet with this truly magical project. Using the idea of freely formed circles to create the sky and clouds, this design builds upon itself to create a beautiful pattern comprised of clouds, blue sky, and rainbows. 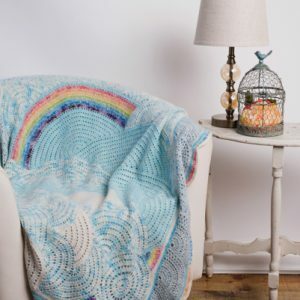 The entire blanket is worked in two strands of yarn, includes more than 70 freeform circles to create a gorgeous texture. Check out the article on the next page to learn more about freeform crochet and get ready to be inspired! Flowers in 3D work so well in this super squishy yarn! This statement piece can be worn many ways — closer to the neck for a marvelous bouquet to frame your face, or wrapped around one or both shoulders.